The first game of this lesson starts off with the class imagining that they have just survived a plane crash in a cold remote mountainous area. In order for them to survive, they have to walk 200 miles through a forest to a village they saw from the air before their plan crashed. Students are then given 3 minutes to work together, discuss, and choose 3 items from a list of 14, to help them survive their journey. After the class has chosen their 3 items, a discussion is conducted to see what they chose, and why they chose those particular items. Note: This game is very challenging, so much so that most adults would find it difficult to select the best 3 items from the list. This game is meant to test the students knowledge of wilderness survival and points out that, at their age, their lack of wilderness survival knowledge means that few of them, if any, will survive this scenario. 1. What does it take to put a man to the moon and bring him back to earth safely? 2. What does it take to survive this wilderness survival experience activity? 3. What does it take to be successful and reach your path of excellence? From these questions, it’s pointed out that these things won’t happen by accident, they will only happen if people have the knowledge and expertise and make it happen. 1. To get them to think and evaluate what choices they’re making in their life. why are they doing doing those things? It’;s pointed out that though students may not have the knowledge and expertise to survive a wilderness experience such as this now, they could get the knowledge and expertise through study and learning from those who do have the knowledge and expertise. 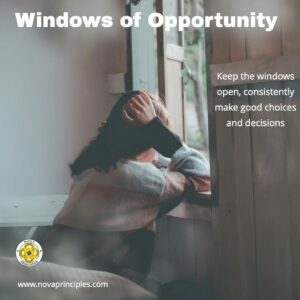 Likewise, students are taught that they have been given knowledge, tools, and the directions in the NOVA Program to help them get to their Path of Excellence and be successful in life, if they choose to follow these things. The second game of this lesson is then introduced. For this second game, students earn points depending on the roll of the dice. This game requires students to make choices as to when they should or shouldn’t risk loosing points they have earned throughout this game. The instructor plays this game with the students, and actually mentors to the class, without telling them, the best way to play so that it becomes impossible to loose even a single point. In this extremely exciting game, students learn that if they follow the instructor’s example, they too would never loose a single point. Students are taught that in this game, when played correctly, no one need loose any points, and that there is enough room in this game for everyone to be a winner. From this premise, students are taught that life is the same. That there is enough room in life for everyone to be a winner, if they choose. This is done by always making good choices, taking advantage of good opportunities, and by avoiding harmful and dangerous things and people. 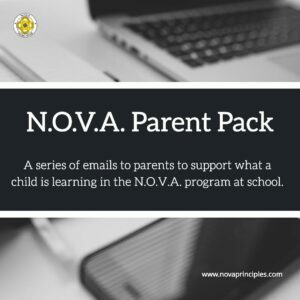 Pack”, you have the opportunity to view the “N.O.V.A. Parent Seminar Part 2″ video. This powerful video will give you more knowledge and tools to help you teach your children how to learn responsibility and accountability through consequences in order to help then get to their path of excellence!